Fido is a Latin word and means to trust, to confide in, to believe. As it’s not popular, how did it become a name referring to any dog? We have to go back in time to Abraham Lincoln, 16th President of the United States. Lincoln suffered spells of depression and as many pet owners do, he found comfort in his pets who helped him improve his moods. Lincoln supported all animal rights as well as human rights. Although particularly fond of cats, while living in Springfield, Illinois in 1855, Lincoln rescued a dog. He named this yellow retriever/shepherd pup Fido. The attachment of man and dog was mutual and Fido could be seen accompanying Lincoln wherever he went. However when Lincoln was elected President and the family prepared for the train ride to Washington, D.C., Fido’s life changed. Mary Todd, Lincoln’s wife, was not fond of Fido and took the opportunity to convince her husband that the train ride and exacting life as President in D.C. would traumatize the dog. Although Lincoln and his sons were heartbroken at the thought of leaving Fido, the President realized that it would be best for the dog. A local man named John Roll who had two young sons agreed to care for Fido until Lincoln’s term as President was over and then the dog would be returned. Roll accepted Lincoln’s requests that Fido have the run of the house, never be tied or left alone outdoors, be let out when he scratched at the door or be punished for having muddy paws in the house. Lincoln gave Roll Fido’s favorite couch so that the change would be less stressful for the dog. To comfort his sons, Lincoln took them along with Fido to a local photographer. He had the boys photographed with Fido and gave each one a copy. Fido became the first Presidential dog to officially be photographed and reproductions of the photos became very popular. Then came that terrible time in America’s history when Lincoln was assassinated. On April 15, 1865, grieving mourners stood silently watching the train carrying Lincoln’s body as it passed their way. John Roll, along with people from all over the country who gathered at the family home in Springfield, took Fido to pay his last respects to the President. Mourners took comfort in the presence of Lincoln’s beloved dog. Photos of Fido, taken when Lincoln became President, became more popular and were sold as souvenirs. Fido died a year later. 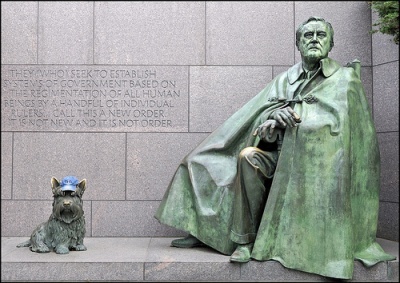 Much like Lincoln, Fido was from humble beginnings and he and his name came to represent all common dogs.